photo courtesy of Encyclopedia Britannica, Inc. Thanks to Dr. Robert Morse, ND, who has rung the bell about how stagnation of the lymphatic system causes the majority of “diseases”, the Lymph System is starting to get the attention it deserves. 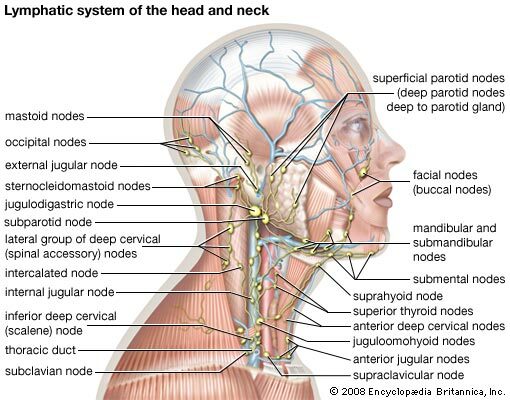 The lymphatic system is a highway running interstitially throughout the body that grabs cellular wastes, takes it to the lymph nodes that have bacteria to break them down (see the danger of too many antibiotics?) and then carries it to the kidneys for elimination. Dr. Morse speaks of the two major fluids in the body: the blood and the lymph. He further explains that every living thing eats and poops. The cells in our bodies are no different. If the cells are nourished or fed by the blood, then the waste that they create is dumped into the lymphatic system. The job of the blood is to nourish the major organs and the job of the lymph is to carry the leftover cellular wastes to the kidneys. It is then the kidney’s job to filter these acids from the lymph out of the body via urination. The problem comes in when we eat primarily acidic foods (dairy, meats, grains, processed foods, baked goods, sugary drinks and snacks) and not enough alkaline based foods (fruits and vegetables). This acidity overburdens the lymph system and stagnation begins. And if the kidneys are in turn overburdened trying to process this large amount of acidic waste, then our skin has to take the brunt of lymphatic elimination. We see it in rashes, eczema, melanomas, acne, boils, skin and nail fungus, etc. Over time, a persistent condition of acidosis is created and begins to burn up the cells and tissues. This burning causes mutation and degeneration, but medical doctors like to call it various diseases based on where this degeneration occurs in the body because they don’t understand the lymphatic system. Since the body is always striving for balance, it has to compensate for this over acidity by making cholesterol (the body’s antacid), and starts to steal alkaline calcium from the structural system – bones, teeth, and vascular walls. To matters only worse, you then have medical professionals giving you prescriptions and treatments that are even more acidic for a disease that really doesn’t exist except to help explain what they don’t understand. The vicious cycle never ends. We get sicker, they get richer; yet, we trust them. We keep going back to let them treat the next symptom that arises out of our overly acidic bodies that they helped create. The only way to end the suffering is take back control over our lives. We must counteract the acids: stop eating acidic foods, introduce alkaline foods that nature has provided and get the lymph moving (astringent fruits, activity, herbal medicinals) and the kidneys filtering it out.